UPDATE: Vegan Status - The eight packs we reviewed are vegan (see the ingredients panels at the bottom of the page). Goody Good Stuff have clarified which products contain beeswax, and the situation is complicated. Don't mistake Koala Gummy Bears for Sour Koala Gummy Bears for instance! The Goody Good Stuff website isn't very clear, and the packs are not marked as vegan, so use the following list that the company provided this morning (2013-05-17). 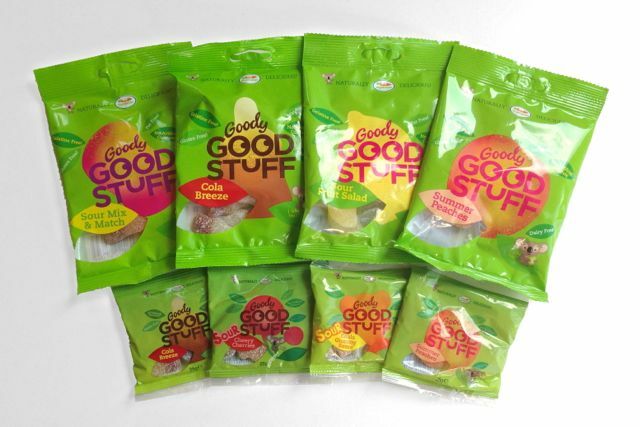 The Goody bags we received were 100g big bags, as well as some 25g mini bags which are available in mixed multi packs. 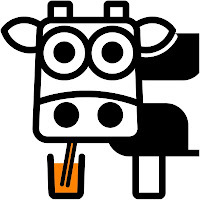 The interesting thing is that the ingredients vary between the pack sizes, with the big bags using gellan gum and the mini bags using carrageenan as their respective gelling agents. 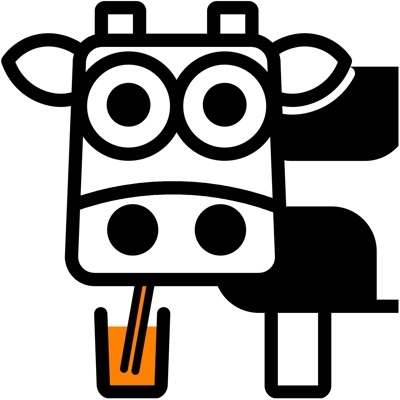 The carrageenan results in a chewier chew. Soft chewing and definitely peachy tasting. Sweet rather than sour. 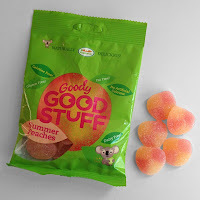 We've never had vegan peach jellies before, so have nothing to compare them to. Smaller jellies and much more chewy than the peaches in the big bag. We prefer the mini ones. More fun than the peaches, with just a little hint of sourness to tingle the tongue. Soft chewing for cola bottles - softer than some other vegan ones we've tried. We like these. Firmer and more sour than the cola bottles in the big bag. 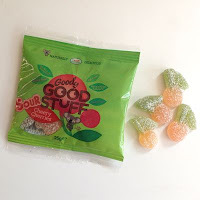 We like sourness, so we like these even more. A mix of flavours, some more sour than others, with the lemon yellow ones having the most tartness. These are quite large wedge shapes and again are quite soft jellies. 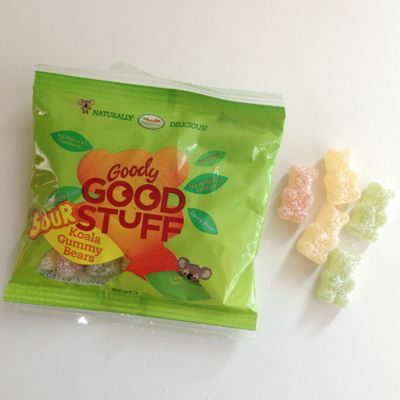 Don't get these confused with the Sour Fruit Salad...these Sour Mix & Match are much sourer, and are our favourite of the large bags. These are little dumbbell shapes and are just a little more chewy too. 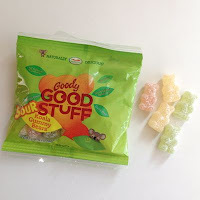 The softest chewing of the mini bags, these are pretty sour and pretty delicious. The flavour tastes just like cherry cola. C-O-L-A cola. Really small, really firm and really sour. The sides of your tongue will wince as you eat these...which is a good thing in our book. We saved the best until last. 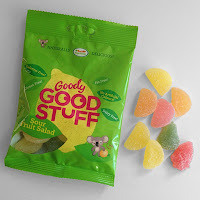 If you like sour, chewy jellies, like we do, you'll love these. This is probably the biggest and best range of vegan jellies available. They're relatively widely available at both wholefood shops and supermarkets, and you'll certainly bump into them if you go to a vegan festival. We have a preference for the sours, which are nice and sharp, but that's down to taste, and yours may be different. It's a bit of a shame that there's no consistency between the pack sizes. 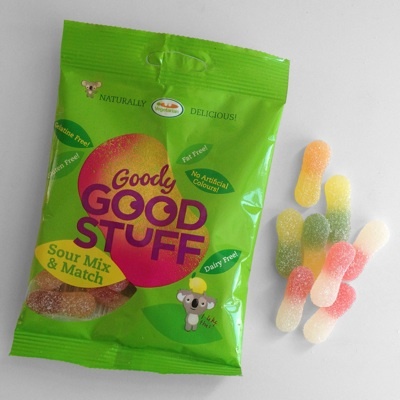 The mini bags are firmer and more sour (which we prefer). We dislike the fact that not all of the range is vegan. It makes it much harder just to grab a bag with your shopping, as you have to read the ingredients. Beeswax is the offending ingredient to look out for. 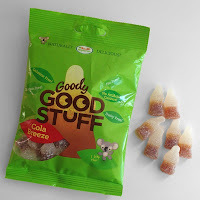 I've not seen the 'sour' cheery cherries/ koala gummy bears yet. Can't wait to try them.